Ann and I are very pleased that you will be working with us in our apartment in Los Angeles, and we look forward to meeting with you there on June 6. This will be the fourth time you will have performed interior design services for us over the past 15 years and, in fact, you have done so for every residence we have owned during that period. Starting with the villa at Mauna Kea in 1984, then in our new home at Mauna Kea in 1988, which coincided with our new high-rise condominium in Atlanta, and now our new high-rise condominium in Los Angeles you have created environments that are distinctive, and yet very much our own. 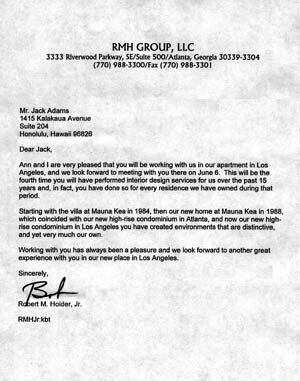 Working with you has always been a pleasure and we look forward to another great experience with you in our new place in Los Angeles.